Infographic: Can Facebook Get You a Job? Social job hunting has become a popular method for job seekers and employers, about 54% of all job seekers use either Facebook, Twitter, or LinkedIn to search jobs. This infographic illustrates statistics on social job hunting and how social media is becoming an effective way to land a job. WORLD OF WARCRAFT: Hilarious New Promo Commercial Featuring Chuck Norris! Chuck Norris didn’t break a sweat filming the newest World of Warcraft television spot. Instead, he made the director cry and then cooled himself with the tears. This World of Warcraft television commercial debuted on CBS during the first half of the Chargers-Bears NFL game Sunday, November 20, 2011. Here we have a 4 page preview of the issue which marks the beginning of the “Exalted” story arc, and the beginning of much more besides by the looks of it!.. If you were wondering which of today’s new comic releases pick up this one has to make the list. Issue #44 of Astonishing X-Men begins a new storyline which is being hailed as “the biggest, most exciting X-Men story in years”. We’l see about that, but that cover image immediately grabs my attention anyway. Here is the preview.. It was announced today that Image comics, the house of Spawn and The Walking Dead, will create their very own comic book convention: Image Expo to launch in February of 2012…the company that shook the comic book industry is at it again. Back in 1992, 7 comic book creators Todd McFarlane, Jim Lee, Rob Liefeld, Marc Silvestri, Erik Larsen, Jim Valentino and Whilce Portacio left Marvel Comics in an ongoing dispute over creator controls and royalties. Thus Image Comics was created and went on to creat characters such as Spawn, The Maxx, Savage Dragon and The Walking Dead. Image Comics succeeded in shaking up the Comic Book industry and opening it up for independent companies to thrive. Now, Image is at it again. The company just announced that they will be launching their own Comic Book/Creator convention in California to launch in February 2012. With the recent success of The Walking Dead as one of cable television’s highest rated shows and the up coming movie projects for Spawn and Youngblood, image seems to be capitalizing on the growing business of conventions around the country. Will this then limit the big guns (McFarlane, Kirkman) from appearing at other conventions. Will Image now hold their major announcements for their own convention? Does anybody really care? Read the full press release from Image comics with upcoming guests, convention schedule and where to sign up to attend and exhibit…click the pick below. Syfy has ordered a pilot script from Fringe writer Andrew Kreisberg for a small screen adaptation of Booster Gold. We have all the details on the creative talent behind the show as well as details on its premise here. The Hollywood Reporter has exclusively revealed SyFy’s plans for a small screen adaptation of Booster Gold. The network has reportedly ordered a pilot script for what will be a one-hour drama from Fringe writer Andrew Kreisberg. Greg Berlanti’s production company will oversee the project in association with Warner Horizon Television. It will credit both Berlanti (Green Lantern, No Ordinary Family) and Kreisberg as executive producers. DC Comics are expected to receive similar credit. They also reveal a few details about the premise of the planned series. WinX is once again offering you the opportunity to get your hand on a free copy of one of their products. Digiarty Software is allowing us to give away 10 copies of their WinX DVD Ripper Platinum for you to enjoy. I don’t know about you, but I’m plenty excited to see the Muppets back on the big screen. It’ll be nice to reunite with our old friends Kermit, Fozzie, Rowlf, Gonzo, and Miss Piggy. However, when it comes to Muppet movies, it’s more than just the Muppets themselves. Jason Segel, Amy Adams, and Chris Cooper will join a long and proud history of actors who shared a screen with the Muppets. Today, let’s take a look back at the best human performances in a Muppet movie, and come next week, we’ll see how Segel, Adams, and Cooper stack up against these classic performers. It is said those who cannot remember the past are condemned to repeat it, but remembering everything is quite a chore these days. Luckily for most of us, there’s an app for that! 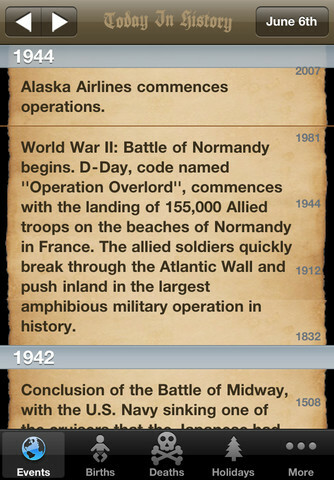 Today In History from Down-Shift Inc. is an app that gives history buffs an easy, high tech way to access historical information. Facts and trivia nuggets are spoon fed in a day to day format. Each calendar day will show you events of that date in past years, beginning with the most recent and spanning backward. It literally is an encyclopedia of historical information for each day of the year. To find out more about a certain event on the list, simply touch it to reveal a page with further insight and external links with more data. Customize the events by logging in with Facebook or create and account to add comments to the event page. Favorite those you want to keep track of or add your own events and create a personal timeline. Of course make sure you keep it social by sharing with friends on Facebook, Twitter or email. First trailer for the Hobbit coming soon? With the news that Dark Knight Rising’s trailer would be hitting theaters in December it got a lot of people wondering what other trailers we would see attached to the big holiday movies and it looks like we may see the first trailer for The Hobbit attached to a December release. According to IGN.com Andy Serkis who plays Gollum in the upcoming Hobbit films recently gave an interview and spoke regarding when we could see a trailer. There will be a trailer fairly soon, actually. Around Christmas time, I believe. It’s just around the corner. If I was a betting man I would imagine you would see it attached to Peter Jackson’s next film “The Adventures of TinTin” which hits theaters on December 21, 2011. John Carter is a film that has been passed around from studio to studio for awhile now and it finally looks like Disney is going to be the one to get it onto the big screen. It looks pretty epic mixing sci-fi with swords and sorcery almost like Tron meets Conan. Check out the trailer and let us know what you think. We get our first look at the full length trailer today and I’m still a bit torn on how I feel about this film. It seems very derivative of The Japanese film Battle Royale from just a cursory glance. I don’t know much about the back story but I’ll do my best to go into in with an open mind. Set in a future where the Capitol selects a boy and girl from the twelve districts to fight to the death on live television, Katniss Everdeen volunteers to take her younger sister’s place for the latest match. Michael J. Fox recreates classic scene for charity. Michael J. Fox recently performed a re enactment of the rock classic Johnny B. Goode from the Enchantment Under the Sea Dance scene in Back to the Future to raise money for Parkinson’s research. It’s not the first time he has done this as a few years back he performed the same song with The Who at the same event but it’s still pretty cool to see him out there putting on a show and bringing back some great memories. Over the years Adam Sandler has made 2 different types of movies, movies that make money and movies that don’t make money. It should come as no surprise to you that the amount of money that an Adam Sandler movie makes is directly proportional to how awful the movie is for the people watching it. So terrible movie = lots of money, great movie = no box office business. Check out this cool infographic from ScreenJunkies.com that gives you an inside look at what movies have made Adam Sandler money and why he keeps making bad ones. Some games are works of wonder and beauty, and playing them reaffirms our humanity. When life is hard and stressful, those games make us forget our worries and allow us to relax, giving us a rejuvenating boost that allows us to face another day. These are not those games. These games make our urge to kill rise just a little bit each time until we prove critics right about video games causing violence by hunting down the level designer and throttling him. Instead, though, we have to stifle those murderous urges, especially since we’re more likely to take them out on our poor controller. Ridley Scott confirmed with the Wall Street Journal Blog Speakeasy that he will indeed be returning to the scene of one of his most beloved sci-fi films, Blade Runner. I’m not a huge fan of the film but I can certainly appreciate what it meant to a generation of sci-fi fans as well as the huge impact it has had on so many films. The challenge now is whether they can recapture that magic and live up to the hype and scrutiny that will surely come.